Sensei Robert Alejo is a 3rd Degree black belt ,certified personal trainer and an extreme athlete experienced in long distance running and marathons. 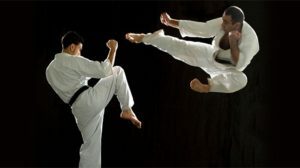 A passionate champion of health and fitness, Sensei Robert has over 20 years experience teaching Kyokushin, a total body and mind training that greatly improves stamina, muscle tone, flexibility, balance and strength – while reducing stress. He is also a respected personal trainer who has developed successful programs to help clients reach three goals, whether ether are for weight loss, recovery from injury or sports and athletic purposes. For those interested in mountain biking, surfing and long distance running, Sensei Robert offers training and guided excursions. Sensei Robert celebrates every student and every client as they transform their bodies, minds and overall health!